How hilarious is Unbeatable Squirrel Girl #7 you ask me, oh metaphorical reader? Even the title page is a laugh riot. Unfortunately, it will cause the Iron Man song from the 1960s cartoon to get stuck in your head. And if you don't know it, you will feel compelled to seek it out on YouTube and listen to it. Resist its siren song, dear reader! There is the path down which madness lies! Speaking of madness, this issue sees it taking over Manhattan thanks to a mischievous Norse squirrel god. No, really! Squirrel Girl and her classmates are on the case but this is a bit beyond even her pay grade. Or it would be if superheroes besides Luke Cage and Iron Fist got paid. So after stealing Captain America's phone (long story and totally justified! 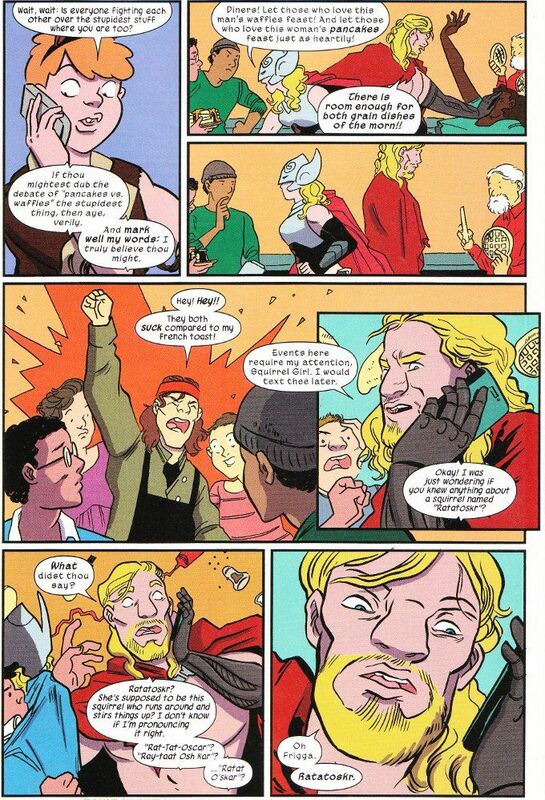 ), she puts in a call for help to Thor. Both of them. This is one of my favorite books to read each month. The scripts by Ryan North are always enjoyable. The artwork by Erica Henderson and Rico Renzi is equally amazing. If you like fun and fun comics, you should be reading this.